Bidet toilet combo, or integrated bidet toilet, whatever. They meant the same thing. It is a stand-alone one-piece toilet with an integrated bidet. Pretty much like a smart toilet but the flushing mechanism resembles that of a regular gravity-flush tank and bowl crapper. Alright, this article is not meant to educate you more than the above description of the toilet. Instead, it is to help you decide on which of the two popular bidet toilets you intend to acquire. You need more information before making a purchase decision, and you are here precisely for that. Nonetheless, the description fits the Bio Bidet IB-835 more than the TOTO G400. Or you could say, the IB-835 is more mechanical (serviceable) than the G400. You will find out in a while how is that so as you go through the comparison. So let’s cut to the chase and get you informed of the differences between the two toilets. Let’s begin with the porcelain part, the toilet features. Which Bidet Toilet Combo Is Your Champion? A few characteristics are important to determine if the toilet is of a decent build or design. And these features impact the flushing power and rinsing efficiency during a flush, just like any regular toilet, or more precisely, the siphonic toilet. The Bio Bidet IB-835 (or USPA IB-835) and TOTO G400 belong to the siphonic flushing type. But you are not about to embark on a fault finding mission here. Both toilets work well, so you should be looking at which one has better features, and ultimately which bidet toilet offers the best value for your money. The features you should be looking at are the water volume (flushing capacity), trapway diameter, flushing system, bowl surface glazing, and water surface size. These are specifics that should be of or exceed the industry standard for a modern toilet. Last but not least, maintenance and upkeeping should also need to be taken into consideration. No matter how good is the toilet made, there is wear and tear over time. Parts need to be replaced, so is it easy to get replacement parts? And are they expensive? You need to know. When it comes to flushing, power and efficiency are not mutually exclusive. The ideal flush is always to use the least amount of water to remove waste and clean the bowl at the same time. While 1.6 GPF is the regulated maximum flushing capacity, it does not necessarily mean a more powerful flush compare to a lower flushing capacity. In other words, less can be more when other components also contribute to the overall flushing efficiency, such as a glazed bowl surface and trapway. Or additional features that are proven to help with waste removal. In the case of Bio Bidet IB-835 INTEGRATED, presumably, it uses the conventional glaze like any modern toilet out there. That’s fine with it’s 1.6 GPF flushing capacity, which means it is relying more on the water volume to remove waste. And it works well to get you a clean flush. However, in the case of TOTO G400, it has more elaborated features that promise a high-efficiency flush. The CeFIONtect coat on its bowl surface and trapway are proven to be a much better glaze. It is hydrophilic, so water spreads easily over the bowl surface, making it harder for waste particles to stick. As such, the TOTO G400 only needs 1.28 GPF for removing solid waste. Even better, it has a lower flush volume (0.9 GPF) for flushing liquid waste. So if you are all for saving precious water, then TOTO is a clear winner here. TOTO G400 wins with better flush feature using lesser water. The function of the trap or trapway is to initiate the siphon to remove waste from the bowl. The industry size is 2-inch in diameter. Anything larger than 2 inches is desirable as it offers an easier passage for a large mass of waste. The minimum is 1-1/2 inches as set by the American National Standards Institute (ANSI). Most toilets in the market will have a trapway size of at least 2 inches. The TOTO G400 has a trap diameter of 2-1/8″, so that’s a decent size for a smooth flush. However, there isn’t any indication on Bio Bidet IB-835. You can only assume it has the minimum industry size of 2 inches or it should at least meet the ANSI minimum. So let’s give the IB-835 the benefit of the doubt since it also flushes well. Both the TOTO G400 and Bio Bidet IB-835 have decent flushing power and bowl rinsing efficiency. The water flow speed of both toilets is good and have the waterjet (or water channel) well positioned to push waste into the trap. However, there are two schools of bowl design here – Conventional and Modern. The conventional design has holes line along the entire bowl rim. During a flush, water streams from these holes to wash down any dirt that’s on the bowl surface. And the modern bowl is rimless or with an open rim design. It only has 1 or 2 jet holes located right underneath the bowl top. The open-rim bowl is easy to clean and upkeep as there are no hidden areas for debris or microbes to accumulate and grow. On the other hand, the close-rim design will need more effort to maintain in keeping those rim holes free of blockages by dirt and limescale. The conservative IB-835 uses the conventional rimmed bowl design whereas the G400 has a rimless bowl. TOTO G400 uses the 3D Tornado flushing system. It has 2 rim jets to propel tank water into the bowl in a spiraling manner. The vortex of water from the rim jets have a scrubbing effect that is super effective in removing any sticky waste on the hydrophilic CeFIONtect bowl finish. And a third siphon jet, located opposite the trap opening in the bowl, offers the strongest flushing power to push waste into the trapway. If you hate stains and skid marks (who doesn’t), you are better off with the G400 bidet toilet combo. TOTO G400 offers easier maintenance with higher bowl rinsing efficiency. The water surface size of a toilet, besides being a sewer gas barrier, has an impact on the flushing and bowl cleaning. It is always desirable to have a large water surface which also helps to reduce odor during defecation. A decent size water surface would be something like 8″ x 6″. But it will get smaller with the flush volume. That is to say, the lower the flushing capacity, the smaller the water surface size will be. Unfortunately, there is no information about Bio Bidet IB-835 on its water surface dimension. However, as seen on the image below, it does seem to have a reasonably large water surface compare to TOTO’s 5-3/8″ x 4-3/16″. Bio Bidet IB-835 – Reasonably large surface (Actual dimension unknown). Bio Bidet IB-835 bigger water surface size/volume in bowl is better at curbing odor. Ease of maintenance is one factor to consider when shopping for any toilet. In the case of Bio Bidet and TOTO, the construction of their bidet toilet combo offers different levels of serviceability. You either love it or hate it. It all depends on how willing you are to get your hands dirty to maintain the bidet toilet in good running condition. For Bio Bidet, its concept is a full-functioning toilet as one unit, and the bidet as a separate one. The toilet unit will have all the functions similar to a regular tank and bowl with water storage, refilling and flushing components. And the bidet is designed to fit the toilet unit. So you can’t install the bidet on other toilets or fit other bidets onto the toilet unit. They are inseparable in that sense. The good with this arrangement is that you can replace any worn parts individually just like any tank and bowl toilet. Though you can’t use any 3rd party parts, the original parts are relatively inexpensive. But for TOTO G400, the entire flushing mechanism along with all the electronics and motors are housed inside the bidet unit. So without the bidet, the bowl becomes a useless piece of expensive porcelain. And the bidet, or top unit, is sold as a complete assembly. You can’t take it apart and buy only the respective part or parts to replace. If you are one who will call a plumber just to replace a flush valve or gasket, this G400 bidet toilet is more suitable for you. It is maintenance free, so to speak. Bio Bidet IB-835 Inexpensive parts and you don’t mind a little maintenance work. TOTO G400 Maintenance & hassle free but replacement bidet unit is expensive. As it stands, TOTO has better bowl features that utilize a smaller amount of water for its flushing. The only drawback it has is not having a large enough water surface which can help with reducing bowl streaking and smear. But it has the CeFIONtect glaze and Premist instead to make up for the smaller water surface size. And if you like the hassle-free with maintenance, TOTO G400 will be a nice option. Though the bidet unit is costly to replace, you will only come to it a good number of years later. TOTO is also known for its product reliability and durability. As for Bio Bidet IB-835, the toilet features are less exciting with no innovation to stage a clear advantage. It is just playing safe with proven old fashioned technology for a toilet. But that is understandable given that Bio Bidet, or rather USPA, is not a specialized toilet manufacturer compared to TOTO. You can tell from the limited information which you would otherwise see on any toilet specification sheet. And the single flush 1.6 GPF capacity will not go down well with States that have enacted laws requiring toilet flushing capacity not to exceed 1.28 gallons per flush. The only good is that it is more serviceable and low cost to maintain. The parts are less expensive, and you only need to replace what needs to be replaced. If you are used to replacing worn parts on your old tank and bowl crapper, you will find that familiarity with this Bio Bidet IB-835 bidet toilet combo. Now that you have gotten past the toilet part, your final decision should rest on how the bidet features pair up between the two brands. Of course, ultimately it’s still your budget that determines which way you’ll swing. But let’s save the price comparison until the end so you can stay objective to know which is a better bidet toilet for you. This cleaning department looks like a draw as both have the standard oscillating and pulsating wash. But on a closer look, the TOTO G400 have a dedicated softer wash on the nozzle compared to the 2-in-1 nozzle of Bio Bidet IB-835. So does that mean the G400 has an advantage over the IB-835? Soft is a feel and pretty subjective according to individual preferences. What is soft to one individual may be too soft for another. So that’s not a good reference with just the word ‘soft’. Instead, you should be comparing the strength of their respective spray as listed in the specification. TOTO G400 has a maximum spray pressure of 14.5 oz/min (regardless of Rear, Front or Soft wash mode) compared to 600 ml/min (rear wash) and 700 ml/min (front wash) of Bio Bidet IB-835. Now here’s the problem. You can’t compare weight (ounce) with volume (milliliter), they are of different unit. You need to make them equal, so you have to use either ounce or milliliter as a uniform unit before making a logical comparison. And let’s not get into details like temperature, atmospheric pressure, and whatnot before getting the 2 metrics on a common unit. If you convert 14.5 oz into milliliter (ml) with this calculator, you get about 428 milliliters per minute (ml/min) give and take. The conversion is not 100% accurate but good enough to tell the two spray power apart. So it is obvious, Bio Bidet has stronger spray over TOTO. And the dedicated Soft Spray mode in TOTO G400 is an aerated spray that offers a softer touch and not by lowering the water pressure. Likewise, the IB-835 too has its spray aerated for a comfortable wash. So, is a stronger spray better for you? Why not. It cleans better with higher water pressure. Bio Bidet IB-835 Higher spray pressure cleans better. While the Bio Bidet model offers a stronger spray wash, it doesn’t mean the G400 spray is too weak for any good. The type of water heater used affects the water pressure coming out of the nozzle. Both the TOTO and Bio Bidet model use the storage tank heater for washing. And tank-type heater generally provides stronger spray than the tankless ceramic heating system. So what are the differences between the 2 bidet toilet combo if they are using the same heater type? The TOTO G400 heater pre-heats the water and store it in a tank, so you get warm water for washing at any time of the day. It doesn’t need high power since the heater is always turned on. Of course, you can switch off the heater or activate the power saving mode to save energy. But it will take a while to heat up the water in the tank again; pretty much like the water heater tank you use for shower. The drawback is, the storage capacity limits the warm water supply. Once the water in the tank is used up, you have to wait some minutes before warm water can resume. Generally, on a normal wash, the warm water supply can last up to 50 seconds before cold water sets in. Now on to the IB-835 bidet toilet. A hybrid heater is used with a significantly higher power rating. It has a smaller tank to store some pre-heated water to make sure you receive nice warm water from the first contact right till the end of your wash, however long is the duration. You will never have to endure the chill from the water because the warm water supply is continuous or unlimited. Though the power is double of the G400, you actually use less energy because it is only turned on for the wash. And water is pre-heated almost instantly in the tank when you press the water temperature button. So no waiting time and restriction on wash duration. You certainly love the flexibility and convenience a hybrid heater can offer. The only disadvantage of the hybrid heater is its high cost. Bio Bidet IB-835 Unlimited warm water supply offers more flexibility & convenience. The convenience features are operational functions which users can control or set to their preferences. This would include varying water, air and seat temperature, odor control, wash mode, nozzle adjustment, and more. For your convenience, let’s throw them all into a comparison table and see which bidet toilet offers the most features and ease of control. Both the TOTO G400 and Bio Bidet IB-835 comes with a sleek remote control with LCD display and side control panel with basic wash function. TOTO G400 More features for a better experience. Hygiene and cleanliness are probably the reason that set you searching for a bidet seat or an integrated bidet toilet in this case. And you are on the right track as more and more people realize and accept the fact that water indeed does a much better job at cleaning than paper. The biggest win here is that your hand now will never get close to where the Sun doesn’t shine. Life is almost perfect now. But it will be complete when you can do your dirty business without touching any part of the waste disposal device, a.k.a. The toilet. Right? From approaching the toilet, doing the number 1 or number 2 to flushing away the wastes and leave, your hands are never in contact with the toilet. How’s that for a hygiene standard? That is only possible when the bidet toilet combo set you own has the auto open and close seat and auto flushing. 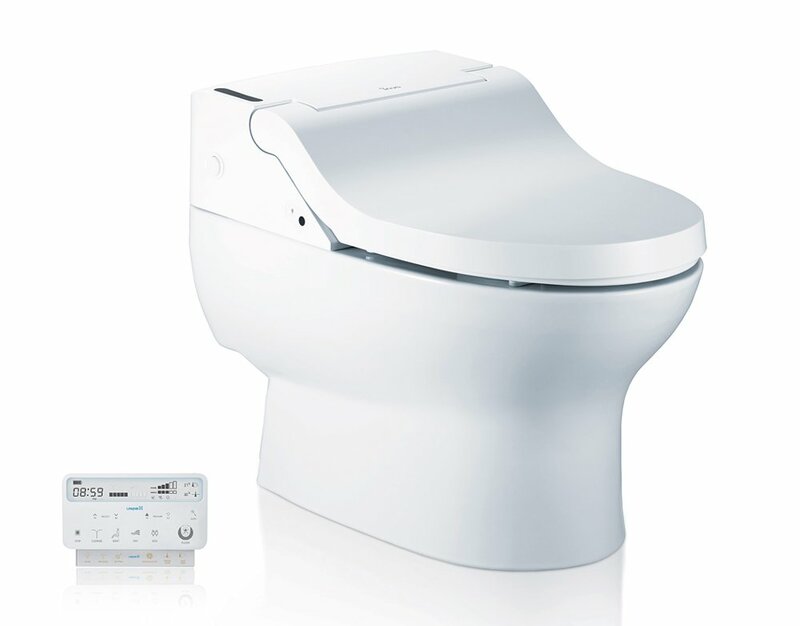 TOTO G400 has the auto seat opening and closing feature, whereas the Bio Bidet IB-835 do not. While both models have the auto-flushing capability, TOTO has an additional feature, the Premist. The moment you are seated, a mist of water is sprayed onto the CeFIONtect glaze. This thin film of water on the bowl surface reduces the adhesion of waste and is proven to help eliminate dirt and waste 80% better than a dry bowl. The Premist is a standard feature across all TOTO Neorest smart toilets and high-end washlet models. So are they on equal footing as far as auto flushing is concerned? With the CeFIONtect ion barrier on the bowl surface and Premist, you are sure to get a cleaner bowl with every auto-flush. And a cleaner bowl is certainly more hygienic than just a clean bowl. 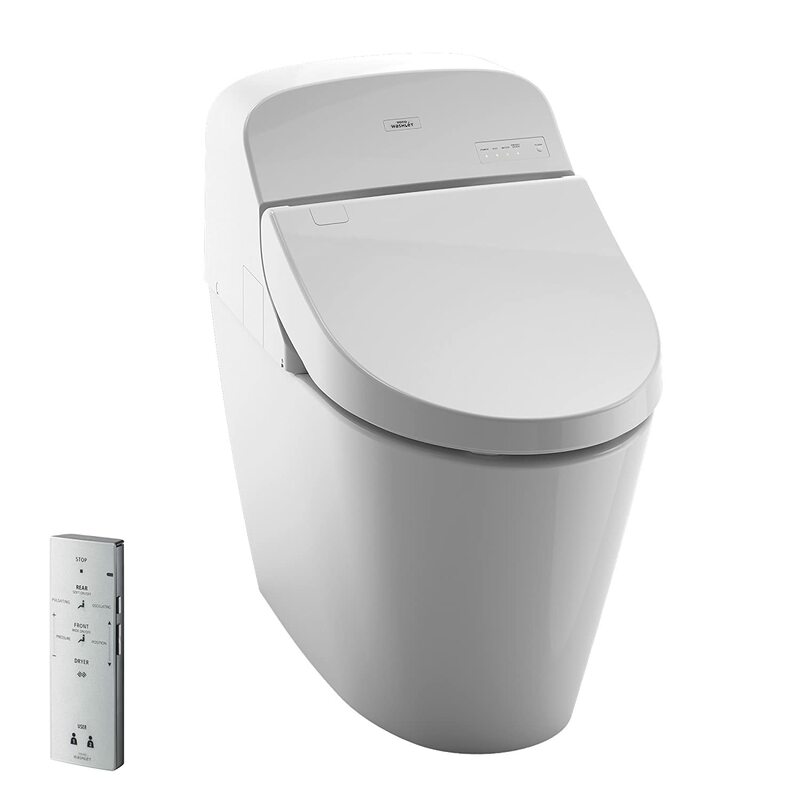 TOTO G400 Provides a hands-free experience and a cleaner auto-flush. So after nine rounds of feature comparison what’s your verdict? Is it the feature-rich TOTO bidet toilet or the more serviceable Bio Bidet combo? Which feature is your must-have and which one you can live without? In your opinion, is there a clear winner here? Or you need to compare the prices to make up your mind finally? That’s fair, and you are only two clicks away to know how damaging they are to your wallet. And a little hint here, the bidet toilet combo with the most features is not necessarily the more expensive one.